There are several entrances and exits to the flea market. 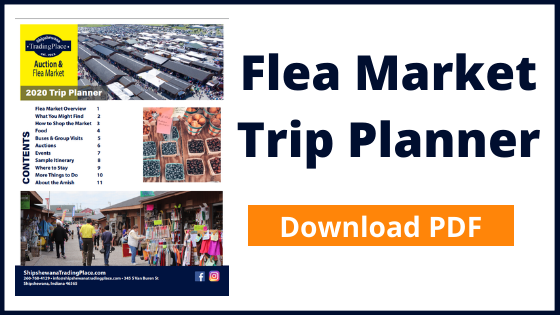 Please refer to the flea market map to plan your entrance and exit strategies. During high traffic times, it is best to exit through the Southeast or North gate. RV / Motor Home / Vehicle Pulling Trailer Parking: $6 (Good for the day with no hookups. Please enter through the Southeast gate from Farver St). RV's staying in the RV Park overnight should enter through the RV Park entrance on Farver St. Overnight, self-contained parking at the flea market is available for $18 on Monday and Tuesday night only. 15-Minute Parking: Available near all entrance gates for those needing to pick up on-hold purchases or heavier items. Misc. & Antique Auction Parking: Buyers should enter from the North or West gate to have access to preferred parking. Please lock and secure your vehicle. Shipshewana Flea Market is not responsible for lost or stolen goods. Shipshewana is less than 200 miles from Chicago, Detroit, Indianapolis, Grand Rapids and Toledo. The Indiana Toll Road (I-80/90) passes through the northern fringes of the county (Lagrange) and serves Howe and LaGrange with exits 107 and 121. US 20 connects Shipshewana and LaGrange to Elkhart and Angola. Indiana State Highways 3, 5, 9 and 120 also pass through the county. Exit 107: South (right) on SR 13 to SR 120, East (left) on SR 120 to SR 5, South (right) on SR 5, 3.5 miles. The Auction and Flea Market is on your left. Exit 121: South (right) on SR 9 to SR 120, West (right) on SR 120 to SR 5, South (left) on SR 5, 3.5 miles. The Auction and Flea Market is on your left.